Global Witness today reveals that at least 207 land and environmental defenders were killed last year – indigenous leaders, community activists and environmentalists murdered trying to protect their homes and communities from mining, agribusiness and other destructive industries. Global Witness annual figures show at least 207 land and environmental activists were killed in 2017 across 22 countries, almost 4 a week, making it the worst year on record. The report shows a huge rise in killings linked to consumer products. 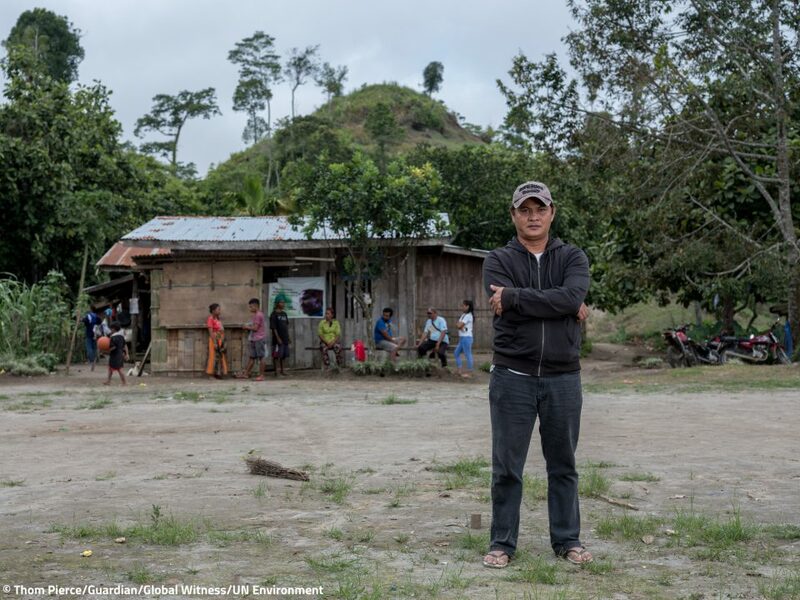 Brutal attacks on those defending their land from destructive agriculture – such as land grabs for palm oil, used in household goods like soap, and coffee – are on the rise. It critically urges government and business to take action to end the attacks and support defenders, with campaigners such as Yuri Herrera, Margaret Atwood, Lily Cole, George Monbiot and Ben Fogle speaking out against the killings. Severe limits on the data available mean the global total is probably much higher. Murder is the most egregious example of a range of tactics used to silence defenders, including death threats, arrests, intimidation, cyber-attacks, sexual assault and lawsuits. The report “At What Cost?” shows that agribusiness has overtaken mining as the industry most associated with these attacks. These include the murder of Hernán Bedoya in Colombia, shot 14 times by a paramilitary group for protesting against palm oil and banana plantations on land stolen from his community; an army massacre of eight villagers in the Philippines who opposed a coffee plantation on their land; and violent attacks by Brazilian farmers, using machetes and rifles, which left 22 members of the Gamela indigenous people severely injured, some with their hands chopped off. The report links this violence with the products on our shelves: large-scale agriculture, mining, poaching, logging all produce components and ingredients for supermarket products such as palm oil for shampoo, soy for beef and timber for furniture. The report also reveals that some governments and businesses are complicit in the killings, with Global Witness calling for urgent action if the trend is to be reversed. As well as being part of the problem, governments and business can be part of the solution. They must tackle the root causes of the attacks, for example ensuring communities are allowed to say ‘no’ to projects, like mining, on their land; support and protect defenders at risk and ensure justice is served for those suffering from the violence. “Local activists are being murdered as governments and businesses value quick profit over human life. Many of the products emerging from this bloodshed are on the shelves of our supermarkets. Yet as brave communities stand up to corrupt officials, destructive industries and environmental devastation, they are being brutally silenced. Enough is enough. “Governments, companies and investors have the duty and the power to support and protect defenders at risk, and to guarantee accountability wherever attacks occur. But more importantly, they can prevent these threats from emerging in the first place, by listening to local communities, respecting their rights, and ensuring that business is conducted responsibly. Brazil recorded the worst year on record anywhere in the world, with 57 murders in 2017. 48 defenders were killed in the Philippines in 2017—the highest number ever documented in an Asian country. 60% recorded murders were in Latin America. Mexico and Peru saw marked increases in killings, from 3 to 15 and 2 to 8, respectively. Nicaragua was the worst place per capita with 4 murders. For the first time, agribusiness was the bloodiest industry, with at least 46 murders linked to the sector. Killings linked to mining increased from 33 to 40, and 23 murders were related to logging. Taking on poachers became even more dangerous, with a record 23 people murdered for taking a stand against the illegal wildlife trade – mostly park rangers in Africa. Global Witness linked government security forces to 53 of last year’s murders, and non-state actors, like criminal gangs, to 90. 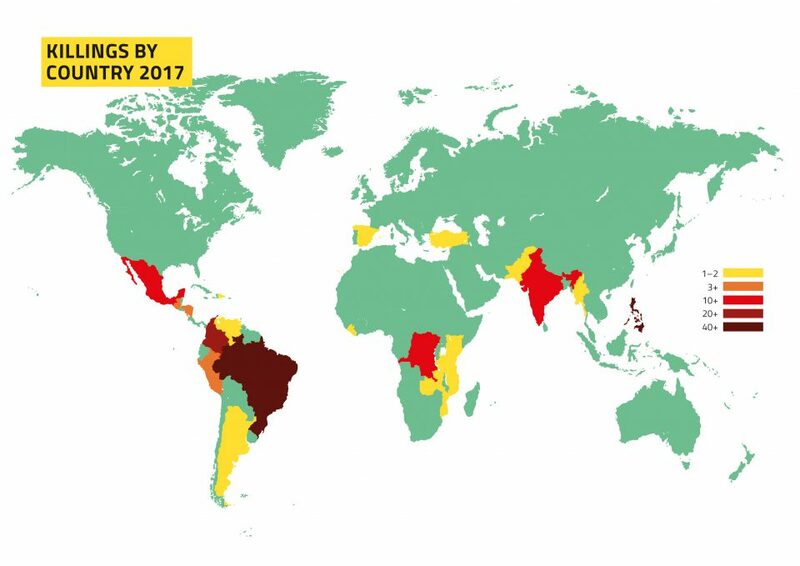 There was a large decrease in killings of land and environmental defenders in Honduras, though repression of civil society in general worsened. Recent years has seen some increased recognition and action taken by governments and business, but much more must be done, and urgently, to tackle this issue. The campaign has gained support from a number of high profile environmental campaigners including Yuri Herrera, Margaret Atwood, Lily Cole, George Monbiot, Ben Fogle, Paloma Faith and Martin Freeman. Quotes available on request. The report can be found here. High-quality imagery and video testimony can be found here. Whilst Global Witness maintains a real time data base with the Guardian this reports represents a consolidated data set of all killings from 2017 that have been through an additional verification process that has been complemented by an in-depth analysis, case studies and recommendations. Severe limits on available information mean the global total is likely far higher. Murder is the sharp end of a range of tactics used to silence defenders, including death threats, arrests, sexual assault, abductions and aggressive legal attacks. Tagged brazil, environmental defenders, environmentalists, Global Witness, human rights, land defenders, Mexico, murder, Nicaragua, Peru, Philippines.